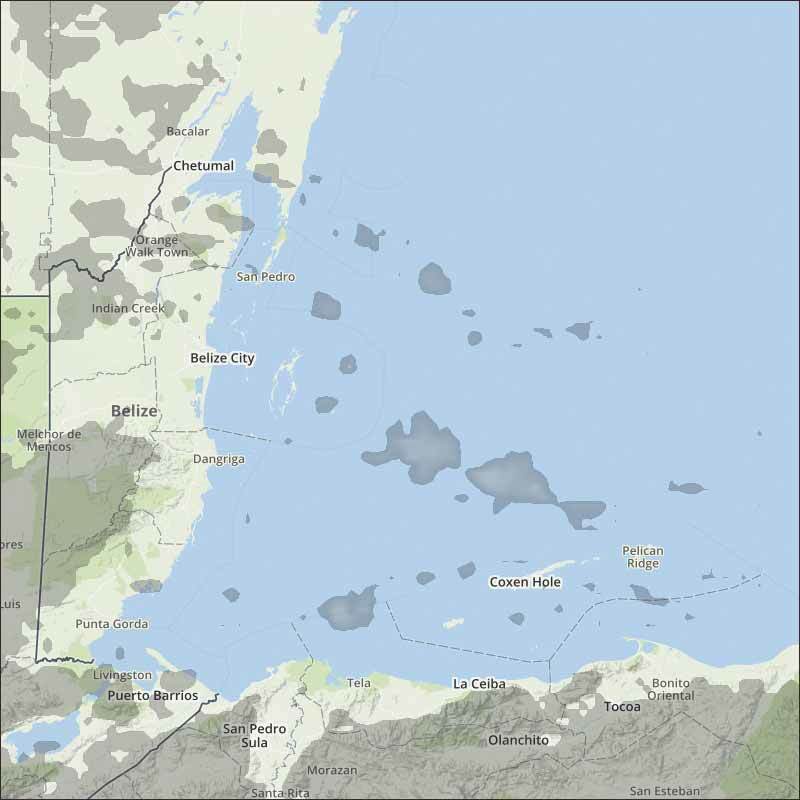 Belize NMS: Light east-northeast airflow prevails over the area. 24-hour forecast: Mostly sunny with cloudy spells today and cloudy at times tonight. Showers will be generally isolated, except for a few more over southern and some coastal areas this morning, decreasing. General Outlook: (Sun. and Sun. night) Generally fair weather with only isolated showers is expected. 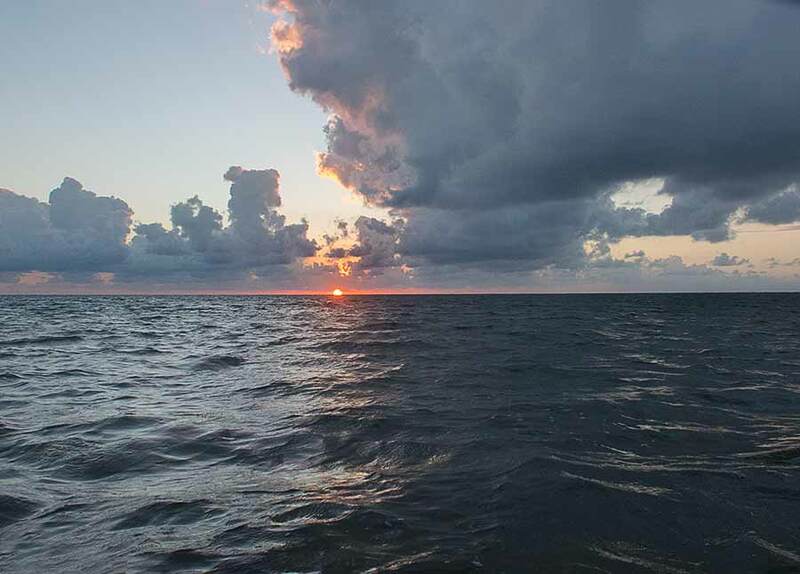 Today E-NE 5-15 kts Light Chop-Choppy 2-4 ft A FEW SHOWERS CENTRAL AND SOUTH, DECREASING. Tonight NE 5-10 kts Light Chop-Choppy 2-4 ft GENERALLY ISOLATED SHOWERS. Tomorrow NE 5-15 kts Choppy 3-4 ft GENERALLY ISOLATED SHOWERS. Outlook E-NE 5-15 kts Choppy-Moderate 3-6 ft GENERALLY ISOLATED SHOWERS. On Ambergris Caye this morning the sea is calm and the wind is from the E-NE at 10 mph. 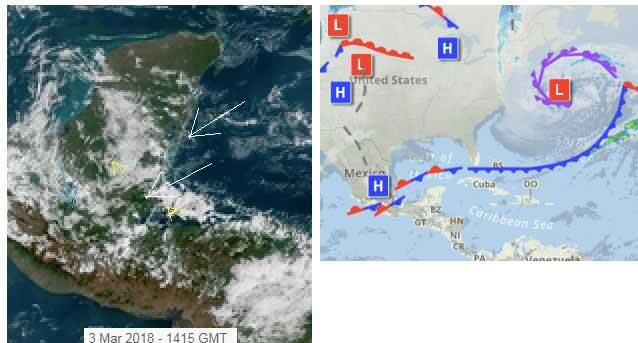 The expected high is 82 f.
There is a large area of rotating air and cloud off the east coast of the USA, which is pushing air down into the Caribbean. 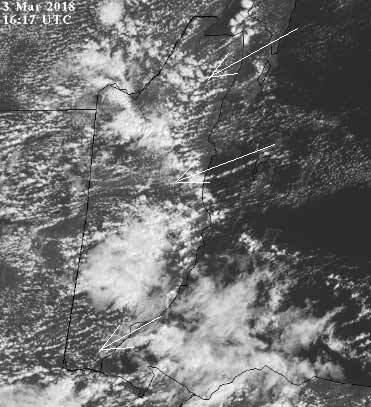 As a result, the Caribbean air over Belize is now from the NE, clashing with air and fog over our area and producing a lot of coastal cloud over Belize and Honduras. It looks as if this should be producing a lot of rain, but it is not, just a very few odd small patches of rain. Looks like today, starting cloudy, will get more sun this morning and a small chance of the odd rain shower. The Cloud picture: Looks like clearer weather will be moving in later today, there are just a few small rain showers around.